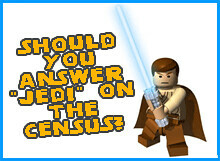 How many Jedi Knights were in the UK 2001 Census? Over 390,000 people answered “Jedi” in the 2001 census for England and Wales and 14,000 in Scotland (a lower proportion). This is more than the number of identifying Sikhs, and more than Jews and Buddhists combined. However, this did not mean that Jedi became an official religion- it doesn’t work like that! Why did people answer “Jedi”? Our recommendation is that if you are not religious, answer “No religion”, because although the ONS will count “Jedi” answers as non-religious, other commentators, organisations, or religious institutions may disaggregate these results and refer only to the explicit “No religion” answers. You would then be omitted if you answered “Jedi”. To be clear: the ONS does say it will interpret “Jedi” answers as belonging under the “No religion” category (and it will report the Jedi number separately as well). However, the concern, as with all specific answers including “atheist” or “humanist”, is that other organisations using the data will disaggregate them. They may for example cite the ambiguity of the meaning of putting “Jedi” (see previous section) and so use only explicit “No religion” answers. This would result in lower figures for the non-religious. If you want to write Jedi as a protest against being asked the question at all, see Why should I answer the question at all? Our campaign is aimed at non-religious people. If you actually identify, religiously, as a Jedi, then that’s what you should put.